The 1st International Spinal Cord Repair Meeting, organized by Step by Step Foundation, was celebrated in Duran and Reynals Hospital in L’Hospitalet (Barcelona). The conference was inaugurated by Ms. Núria Marín, mayor of Hospitalet, Dr. Carles Miquel, Head of Research at the Ministry of Health of the Generalitat of Catalonia, Dr. Xavier Corbella, Director of Bellvitge Hospital, Mr. Frederic Crespo, Founder and President of the Step by Step Foundation and Dr. Filip Lim, member of the organizing committee. In the first session chaired by Dr. Filip Lim (Madrid), Dr. Geoffrey Raisman (London) explained how the use of olfactory ensheathing glia is able to restore rat forelimb function after injury of the corticospinal tract or the dorsal root ganglia nerves. Likewise, in rodent models of injury of the phrenic nerve, which controls breathing, this type of glia is capable of restoring normal electrophysiological recordings from the affected neurons. Dr. Raisman explained that they propose to address the use of autotransplants of ensheathing glial cells, derived from cultures of human olfactory mucosa, for a clinical trial implicating injuries that produce avulsions of the dorsal root ganglion nerves at a brachial level, common in motorcycle accidents. Dr. François Féron (Marseille), summarized the results of the clinical study carried out in Australia, in collaboration with Dr. Mackay-Sim (Brisbane) using autotransplants of olfactory ensheathing glia cultured from the olfactory mucosa of the spinal cord injury patient. In three patients, it was demonstrated that the operation was feasible and safe (conducted in a single-blind study) and in one of them, improvement in sensory function was demonstrated. Dr. Féron is involved with the preparation of a clinical trial in Marseille, to extend this study to a larger number of patients, in whom the cells will be injected into the cerebrospinal fluid. 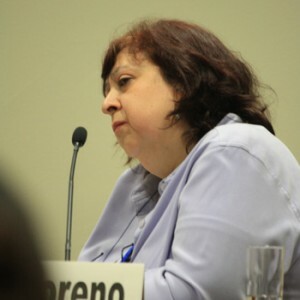 Additionally, Dr. Féron explained the therapeutic effects of vitamin D3, a colecalciferol, in models of spinal cord injury in rats, showing an increase in axonal growth, and functional recovery. 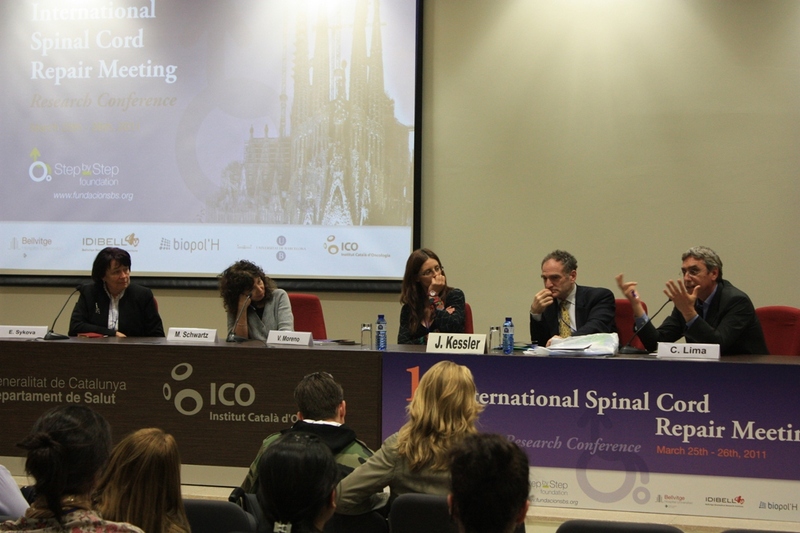 In the second session chaired by Dr. Mª Teresa Moreno (Madrid), Dr. Carlos Lima (Lisbon) spoke of his opinion about the best strategies of regeneration in the spinal cord as well as of the patients transplanted by his team with pieces of their own olfactory mucosa obtained by biopsy (autotransplantation). These patients also received rehabilitation treatment (before and after the operation). Data demonstrating the levels of motor and sensory improvement of different transplanted patients were presented, as well as videos that documented these improvements. Dr. Victoria Moreno (Valencia), presented her results on the use of ependymal stem cells activated by spinal cord injury in rats, employing both undifferentiated as well as cells differentiated into oligodendrocytes and motoneurons. These transplanted cells in injured rodents are capable of provoking functional improvement. Furthermore, a genomics study was carried out comparing injury-activated ependymal cells with unactivated control cells, revealing that activated cells overexpress specific signal transduction molecules of cytokine and MAP kinase pathways. In the first afternoon session, chaired by Dr. John Kessler (Chicago), Dr. Michal Schwartz (Tel Aviv) explained the importance of the difference between microglia with an inflammatory nature present in the center of the injury, and blood-derived macrophages with anti-inflammatory properties (which are dependent on the expression of interleukin-10). Her experimental data with bone marrow chimeric mice indicate that these leukocytes are not recruited to the lesion in sufficient quantities, forming the scientific basis of the clinical trial conducted by the group with autotransplants of activated (by exposure to skin explants) macrophages. In the first clinical trial, at Phase I, they demonstrated the improvement in a number of patients with transplants and currently this has progressed to a Phase II study (PRONEURON). Dr. Eva Sykova (Prague) informed us of the use of cells labeled with superparamagnetic iron oxide (SPIO) particles for monitoring in animals/patients via magnetic resonance imaging (MRI); and the use of hydrogel and nanofiber supports for spinal cord reconstruction and the transplant of mesenchymal stem cells embedded in this type of support. The group is preparing a clinical study with these cells and biomaterials. The final presentation of the day was given by Dr. Elizabeth Bradbury (London), who demonstrated that treatment with chondroitinase ABC in models of spinal cord injury in rodents was capable of stimulating functional recovery through different possible mechanisms: axonal regeneration, but also axonal “sprouting” and neuroprotection of the implicated tracts in her studies, in both motor and sensory axons (corticospinal, rubrospinal and ascending sensorial projections). On Saturday, 25th of March, in a session chaired by Dr. Xavier Navarro (Barcelona), Dr. Anita Buchli (Zurich) explained how the components of myelin (one of which is Nogo) have a crucial role in preventing neuronal regrowth and antibodies anti-Nogo have been tested with success in animal models. Therefore, they have proceeded to carry out a clinical trial in Phase I (NOVARTIS) with the human antibody anti-Nogo ATI355, in which they have tested the feasibility and security of its use in more than 50 patients. Efficacy remains to be demonstrated in the next clinical trial of Phase II. Dr. Antonio Oliviero (Toledo) spoke of his previous data in changing physiological states, such as pregnancy, in which it is demonstrated that a sensory system is capable of compensating loss of peripheral information through the plasticity of the central nervous system; the possibilities of these processes are thus extendable to obtaining functional recovery after spinal cord injury. His presentation focused on the consideration of the parameters which must be considered when setting up a clinical trial. Dr. Rubèn López-Valés (Barcelona) presented his work demonstrating that lipid mediators involved in inflammatory processes and enzymes responsible for their synthesis (for example the different groups of Phospholipase A2 (PLA2), or Prostaglandin D2 acting through its different receptors) can have opposite effects, negative or positive, in nerve injuries. Finally, Dr. John Kessler spoke of scaffolds constructed with molecules of amphiphilic peptides which self-assemble into cylindrical nanofibers which can be modified with specific sequences of growth factors or other proteins (for example the sequence IKVAV, an epitope of laminin, an axonal growth promoting molecule). Dr. Kessler raised the important topic of glial scarring and one of its principal components, the astrocytes. These cells are a source of inhibitory molecules for neural growth after the injury. The bone morphogenetic factors or BMPs are important effector molecules of the superfamily of the transforming growth factors beta (TGF-beta) and Dr. Kessler demonstrated that by acting via their receptors of BMPR1a type o BMPR1b type, they mediate opposing actions in astrocytes after injury, through the regulation of microRNA-21 which controls the expression of the astrocyte marker GFAP. These data, together with those of Dr. Schwartz and Dr. López-Valés, demonstrate that cells and molecular mediators implicated in these general processes of repair/inflammation have effects that depend on the point in space and time at which they act, and through which receptors they signal (highlighting the relativity of their positive/negative influence in the process). Dr. Kessler also updated the conference audience regarding the clinical trial that GERON will begin with the cells GRNOPC1 that contain progenitor cells of oligodendrocytes derived from human embryonic stem cells. It has been demonstrated that these cells are capable of remyelinating and stimulating nerve growth as well as restoring function in animal models of spinal cord acute injury. These cells will be transplanted in ASIA A patients with injury at a thoracic level (T3-T10 neurological level) 7-14 days after the lesion (sub-acute). By means of a roundtable discussion at the end of the sessions on each day, the researchers brought up interesting opinions of all the participants. It can be deduced that there are two important points to be considered: i) it is necessary to proceed to clinical trials since treatment development is urgently needed, but these should always be based on confirmed experimental data; and ii) the study of mechanisms implicated in the injuries and in the action of the cellular and/or molecular mediators involved in the experimental models is fundamental in providing patients with treatments of optimum effectiveness in the future. On Saturday the conference was closed with the participants’ proposal to maintain contact to establish future collaborations which they expect to be highly fruitful, and to encourage the exchange of information. In the end, all of this is to achieve whatever possible, the principal objective which drives us all: to find a treatment which is so much needed by the patients.